In my experience, hotels near railway stations fall into one of two categories. Some are impossibly grand and offer a little bit of old fashioned glam; great gestures of brick and stone that conjure up hazily misplaced memories of the romance of the railroad. I’m thinking of The Renaissance St Pancras, with its excellent Marcus Wareing restaurant The Gilbert Scott, in which you can slurp oysters while waiting for the Eurostar to Paris. Or The Midland in Manchester. Or perhaps Edinburgh’s recently vajazzled Caledonian. On the other hand, there are still plenty of those gone-to-seed hostelries, the Grand in their name made out in tired neon, grubby impersonal places suggestive of transience and altogether different forms of romance. An £8m investment from Chester-le-Street based Gainford Group is doing its best to make the County Hotel, bang opposite Central Station, more of the former than the latter. It’s become rather nice. Years ago, I sat in the bar here to watch some football game or other and it was grim, an over-bright soulless space selling bad, overpriced lager to residents who couldn’t be bothered to leave the premises. As I walked through now, en route to the Hudson restaurant it was transformed into a sleek, parquet-floored looker. 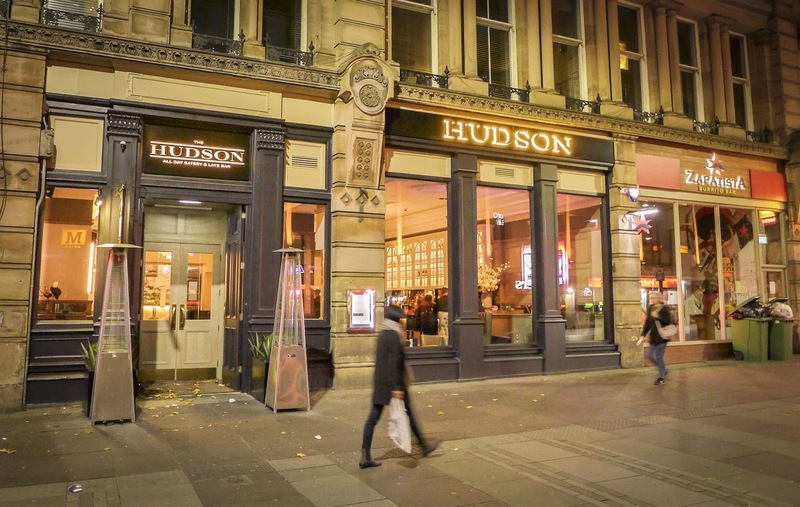 The restaurant itself, named for George Hudson, a 19th Century Railway financier and friend of George Stephenson, has seen quite a facelift too. It’s all velour booths, brass rails and heavy drapes. It may not be my taste per se, but I appreciated the effort. I appreciated even more the service we got during the evening, from one of the flat-out nicest front of house staff I’ve come across in yonks. My receipt says she was called Emma. Emma, or whoever was using Emma’s log-on on the till that night, is a credit to the place. As indeed was a fair bit of the food we ate. Too late for the £14.95 three-course “express” menu, we hit up the rather pricier la carte. 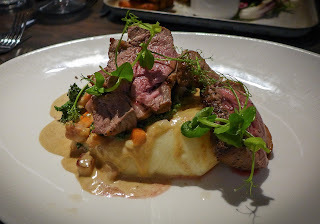 Dish of the day was a straightforward but flavoursome rump of lamb, cooked pink and plonked onto a mound of good mash, the whole business punctuated with green flashes of kale and slicked with a nice cream sauce. 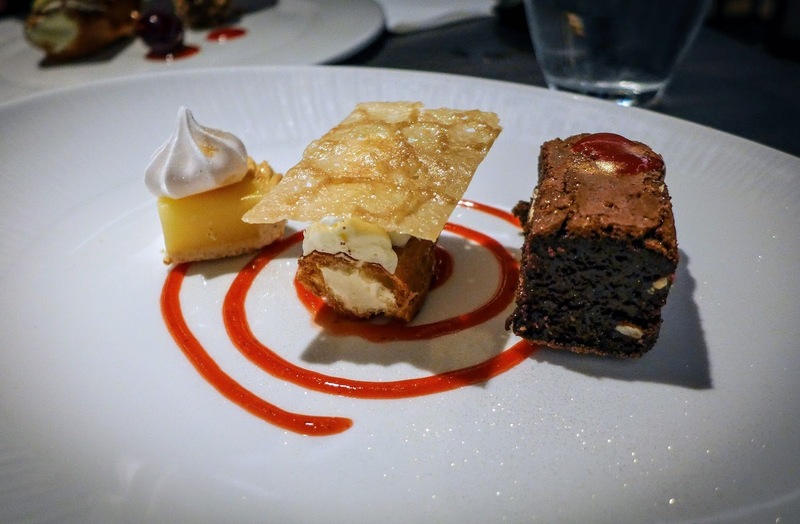 Nothing too showy, just good ingredients put together in an appealing and extremely edible way. 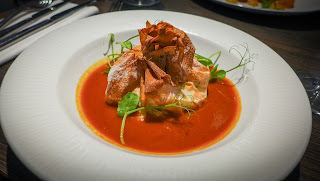 I had ordered a starter of “seafood money bag” mostly just because the name amused me, but my juvenile sense of humour was rewarded with a crisply shattering filo parcel of prawns and salmon in a moat of punchy lobster bisque. The bisque could have used a touch less tomato purée and verged on being over-seasoned, but had plenty of shell-derived flavour. Across the table, Mrs Diner was having - unusually - a slightly less successful time of it. A starter of scallops paired a trio of rather small and un-seared bivalves with similar sized folds of cold smoked salmon and three dots over over-sweet and indistinct squash purée, poor value for £12.95. 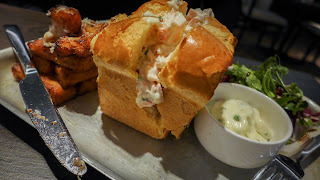 The opposite problem was evident on her main course of 'Hudson Lobster Bun' which wasn’t so much a bun as half a whole loaf of brioche, split unevenly and stuffed with lobster meat. How this was meant to be eaten remained a mystery up to, and indeed beyond the point at which a fair amount of it returned to the kitchen. Chips were greasy and overfired, and served in the once ubiquitous Jenga format which I thought we’d seen the back of in the noughties. All a bit of a shame, for hidden amongst these crimes of portion control was a fairly decent mayo-bound lobster mix. Puddings were mixed. I had gotten quite excited about the promise of a Paris-Brest, one of the finer achievements of classical French patisserie, created in 1910 to celebrate the cycle race between those two cities. The real deal is circular (like a bicycle wheel) featuring choux pastry and praline. 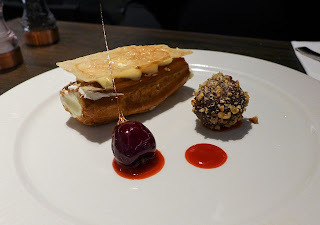 What we got here was a fairly ordinary éclair with regular cream. They wouldn’t get far out of the Vélodrome, never mind to Brest and back, cycling on wheels this shape. Much better were the dense chocolate brownie and bracingly tart lemon meringue pie, which along with another oblong bicycle wheel, made up a tasting plate of mini-puds. There’s an interesting sounding cocktail list, but we stuck to fermented grape juice. We picked out drinkable Montepulciano and Shiraz from a list that offered three each of red and white by the glass. A disappointingly short list for house wines in a brasserie, though. Gainford Group has a track record for employing people who can put together an enjoyable meal. 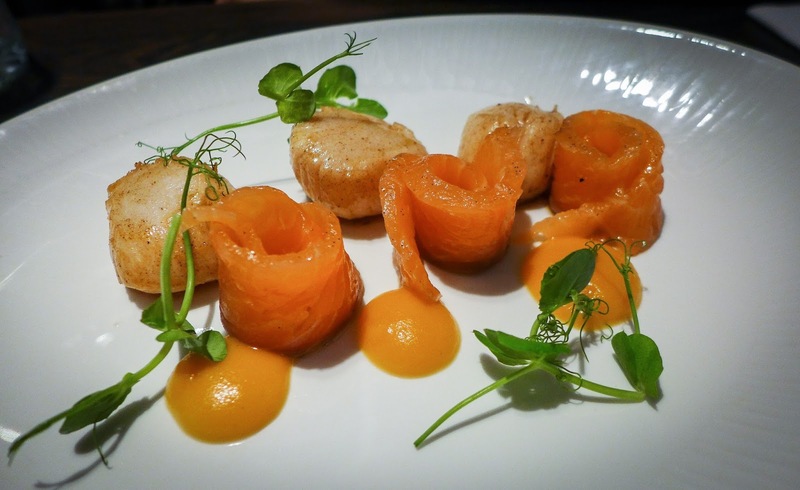 I rather liked Aveika, their clubby Asian offering on the Quayside, and am particularly interested to see what becomes of the dining experience at The Vermont, as I hear Lee Stainthorpe, whose two-rosette cooking I really enjoyed at The Morritt near Barnard Castle, has now pitched up there. Perhaps one day I’ll have cause to find out what the rooms are like. Or perhaps not. I suggested we might try one out for a treat, but Mrs Diner gave me one of those looks. 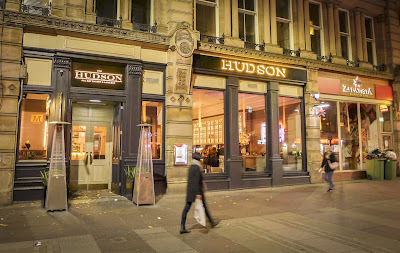 The Hudson might not completely carry off the vibe of elegant opulence that I think they’re reaching for, but it has mostly good food served by some absolutely lovely staff. It's also open all day, so if you find yourself hungry and with time to kill before that train down to London or up to Edinburgh, and fancy something a bit grander than Greggs and a Pink Lane coffee (not that there’s anything wrong with either of those), you now know where to go.